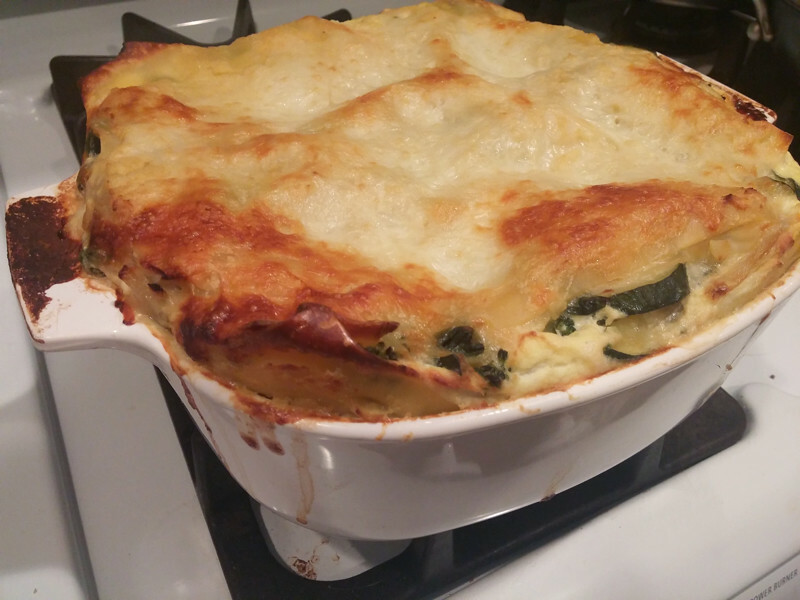 I grew up eating Costco lasagnas - the giant 9x13" frozen ones that could easily feed a large family. We didn't have them very often, so it was always exciting to come home and see it out on the counter, waiting to go into the oven. The waiting was the hardest part - the bake time took well over an hour or two! 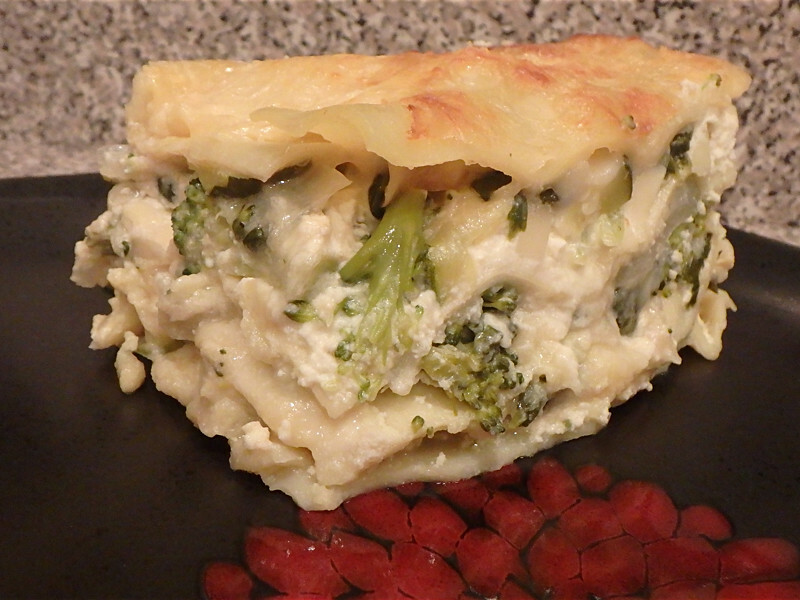 We would usually alternate between meat and vegetable lasagnas, but I remember being partial to the vegetable ones. I mean, how can you go wrong with ricotta, mozzarella, and vegetables?! Shawn and I don't buy much frozen food at all; our freezer is strictly for ice, frozen vegetables, and ciabatta pizza crusts we toss in there for easy dinner nights. We try to cook fresh and cook at home 5-6 nights of the week. I hadn't even thought about lasagna for years until a friend of mine mentioned one she had recently at Reading Terminal Market. Suddenly, it occurred to me that it had been years since I'd had lasagna, and gosh-darn-it, why couldn't I just make some myself? So I did. And it was amazing, and delicious, and... well, just everything I wanted it to be. So here's the recipe! Side note: The cauliflower sauce requires a blender or food processor... don't do what I did and spill the sauce all over the counter while trying to remove the pitcher from the blender base... Somehow the blade part of the pitcher got detached from the glass part and when I lifted it up, gravity forced all the sauce down. Oops. When I told Shawn later, he said "Ew! So we're eating counter sauce?!" Yummy yummy counter-flower sauce. - Preheat the oven to 375°F. Boil the cauliflower in vegetable broth until the florets become tender. Reserve 1 cup of the liquid before straining. - While the cauliflower is cooking, heat 1 tablespoon of oil in a large frying pan. Add the zucchini, onion, and broccoli and cook until everything has softened and the onion is almost translucent. Add the spinach in handfuls and cook until wilted. Season to taste, and set aside. - In a blender, add the cooked cauliflower, garlic, and butter, and blend until smooth. Add the reserved vegetable stock to mixture in small amounts, until you reach a sauce-like consistency. Grate some parmesan into the sauce, and season to taste. - Boil the lasagna noodles as indicated on the package. - While the noodles are boiling, make the ricotta mixture by mixing all the ingredients in a large bowl until smooth and combined. - Now you get to assemble the lasagna! In a 9x9" pan, spread a little bit of the cauliflower sauce - just enough to cover the bottom. Top this with a layer of lasagna noodles. Spread a thin layer of the ricotta mixture atop the noodles. 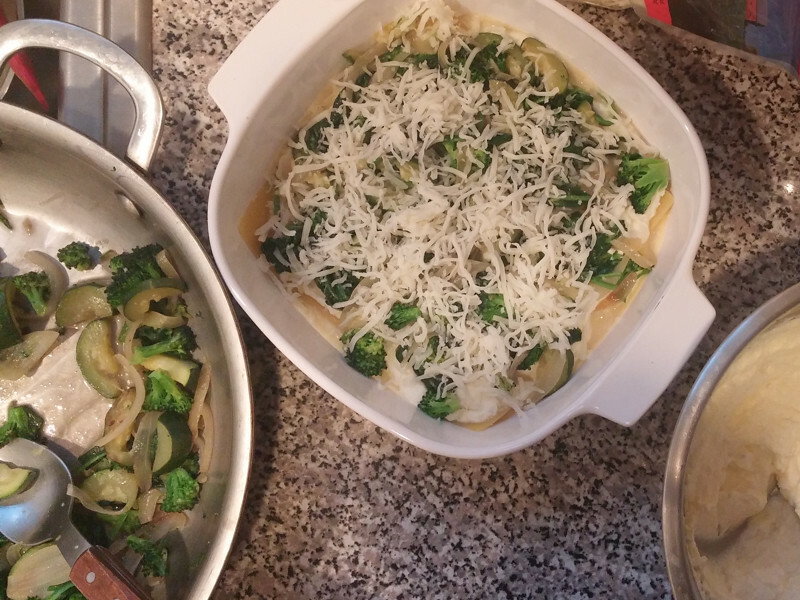 Then spread a layer of the cooked vegetables atop the ricotta. Sprinkle a little mozzarella cheese atop the vegetables, and then start over again. Layer sauce, noodles, ricotta, vegetables, and mozzarella until you reach the top of your pan. (I think I ended up with 3-4 layers.) Your final layer should be noodles, and a sprinkle of mozzarella. Wrap the top of the pan in foil and bake for 20 minutes. After 20 minutes, remove the foil and bake for an additional 25-30 minutes, or until the cheese on top is melted and browned. Let the lasagna rest for a few minutes before cutting into it. Side note: If you don't have a blender, you could just make this without the cauliflower sauce and double the ricotta cheese mixture. But the sauce kinda makes this recipe, so I recommend borrowing a blender from a friend, like I did!